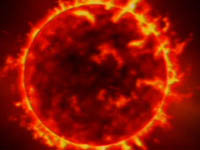 All life on Earth is forged in the furnace of the sun. This vast energy source, one million times larger than Earth, bathes us, from a distance of 93 million miles, in life-giving rays. THE FIRE OF CREATION begins with the sun filling the sky, bursting into the star-pricked blackness of space with a pyrotechnic spectacle of shifting, scorching images. This, Southern California cosmologist Brian Swimme tells David Suzuki and his grandson Tamo, is the way the cosmos began: in a single Big Bang, approximately 13 billion years ago, matter coalesced, and the stars turned on. Swimme considers each day's dawn as a cosmic act of generosity - a vast giveaway of energy. We are all children of the sun, accumulating cosmic energies, transforming them into matter. Throughout the ages human beings have revered this sacred flame. As David discovers on this journey, the findings of science amplify that reverence. With cosmologist Brian Swimme, and anthropologist Stephen Lansing. Coming Home - Suzuki explores biophilia -- the innate, hereditary need of human beings to affiliate with nature.